These are all the local brands of sildenafil that I found in a single pharmacy. There’s the Pfizer-licensed Viagra, but we also have Virecta, Erec, Kemagra, Vigorama, Vigoran, Phragra, and Vigorex. 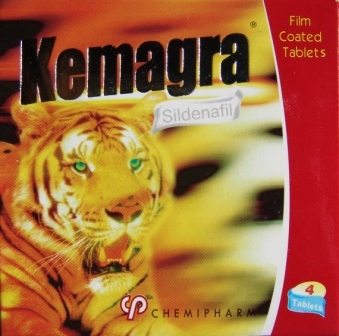 The Kemagra box features a tiger: Rrawr! This takes traditional notions of the virility-enhancing power of seafood and rebrands it with the notoriety of a global pharmaceutical product. 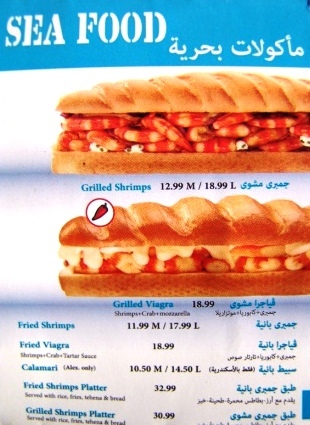 By the way, it seemed that every other restaurant in Cairo has some “Viagra” dish. At the annual date market, one variety of dates usually gets called “Viagra” for the same reason. The office interactions I have with colleagues about the stack of drugs on my desk have given me new insight into the different cultural meanings attributed to erectile dysfunction drugs. You see, every male colleague that comes in has a laugh at the boxes, and then typically I say, “You’re welcome to a box after I finish photographing them.” This usually leads to louder laughter and a protest, as he backs away from my desk: “No thanks, I don’t need it!” The implication seems to be that by accepting the drug, one is admitting to some sort of sexual failure. Perhaps this seems natural — it certainly reminds me of all the ribbing former presidential candidate Bob Dole endured when he agreed to be the first spokesman for the product in the U.S. But in Egypt, this logic just doesn’t work. There, men often give the pills to each other as gifts. According to my Egyptian colleague who is researching the phenomenon, they are sometimes given by an employer to his employees as a kind of reward or incentive. Instead of connoting a lack, it seems to imply the cheerful anticipation of an excess of virility. It may also speak to the history of the drug’s availability in Egypt: before the market was opened up to all the cheap generic brands, Viagra was expensive and in limited supply. Thus the enthusiasm for trading it around was part of the wider intersection between gift economies and the black market economy. Perhaps my Australian colleagues simply disapproved of the idea that I should be offering them drugs for which they didn’t have a prescription. Of course I should clarify that my offers were all in jest: I know that it is illegal for someone who is not a medical professional to give someone else a prescription drug. No, boys, these drugs are MINE, ALL MINE!! Thanks for this article – liked the idea of a stack of drug boxes on your desk – just bound to excite curiosity. I’m off to take a look at your other stuff. I just got word from a colleague in Syria that the following local brands of sildenafil are available there: Vega, Extra, Copra, Silda, Sildifil, and Vilas. If anyone knows what other brands are available in other countries, please post them here! i am a biologist in Egypt right now ,, we do have lots of these brands such as Viagra Erica, Virecta,Copra120,jaguar120mg ,Snafi,Cialis,Levitra,Mamegra,Vega ,kamagra. lots and lots of them . Jaguar! Copra! Snafi! Mamegra! Vega! Mohamad, what fun, thanks for sharing all the other brands that I didn’t manage to collect. 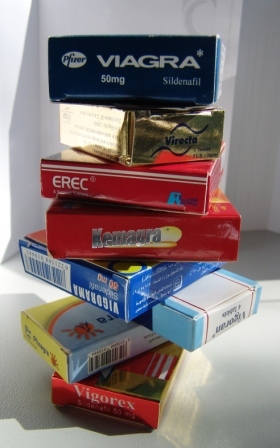 Why do you think there are so many varieties of erectile dysfunction drugs available in Egypt? Any theories? What are the causes of Male Impotence? In addition to stress and anxiety what else could be the reason? Please advise….. This was a very funny read to me, because my boyfriend Jacob’s boss recently received Viagra in the mail at the office. It is Jacob’s job to open all of the mail, sort it, file it, etc. so when the unmarked package arrived, he opened per usual. When he discovered the contents of the box (to his extreme dismay because he and his boss don’t have a great relationship) he tried to devise plans for resealing the box and pretending not to know what the contents were. Of course, this failed and his boss was furious when Jacob handed him the opened box of Viagra. His boss was SO furious, in fact, that mail is no longer one of Jacob’s regular daily duties. When I read this article, I laughed aloud and said “Maybe your boss was just trying to give you a gift like the Egyptians do!” This is a great idea for a research project. I will be conducting a similar cross-cultural medical project in the spring. Best of luck to you!